Greetings from Singapore! Brooke and I are only in this small nation for two days as we close out the Pacific/Asia leg of our RTW trip. 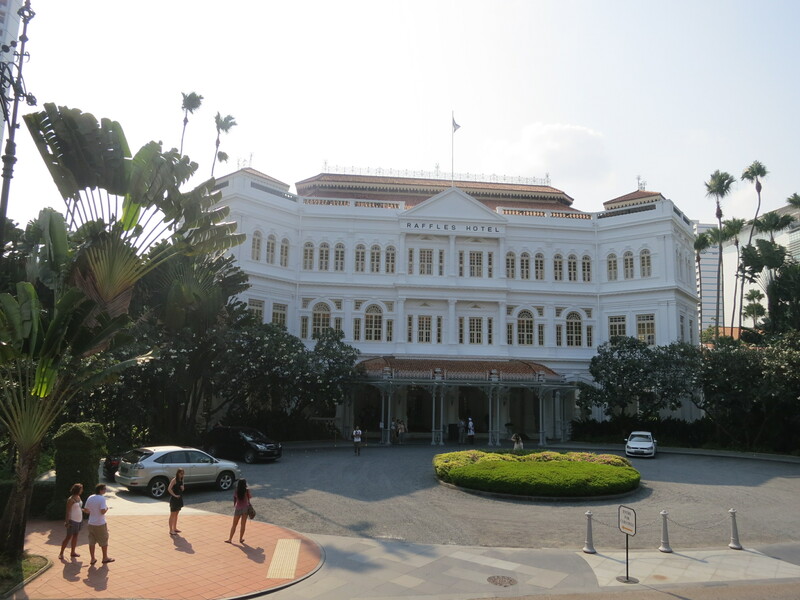 Our initial impression of Singapore? This is the one place so far that has most reminded us of an American city. In fact, and to be oddly specific, its kinda like Chicago. Add in the tropical foliage and location near the equator and Singapore has reminded us of Tampa at times as well. English serves as the official and primary language (thanks to 140 years of British imperial rule), and the city has an udeniably western vibe emitting from familiar looking shopping malls, big name hotels and modern skyscrapers. In short, Singapore has also been our easiest stop in a while. Singapore is unique in that it manages to be a few different things all at once: a relatively small island geographically, a relatively big city socially and a sovereign nation politically. All wrapped into one happy enchilada. The country is made up of a hodge podge of people represented by four ethnic populations: Chinese, Malay, Indian and, um, Other. Yeah, apparently, that last few percent just gets kinda grouped together. Like many other cities we’ve seen, the city itself is heavily populated, but not as densely jam packed or teeming with bodies. 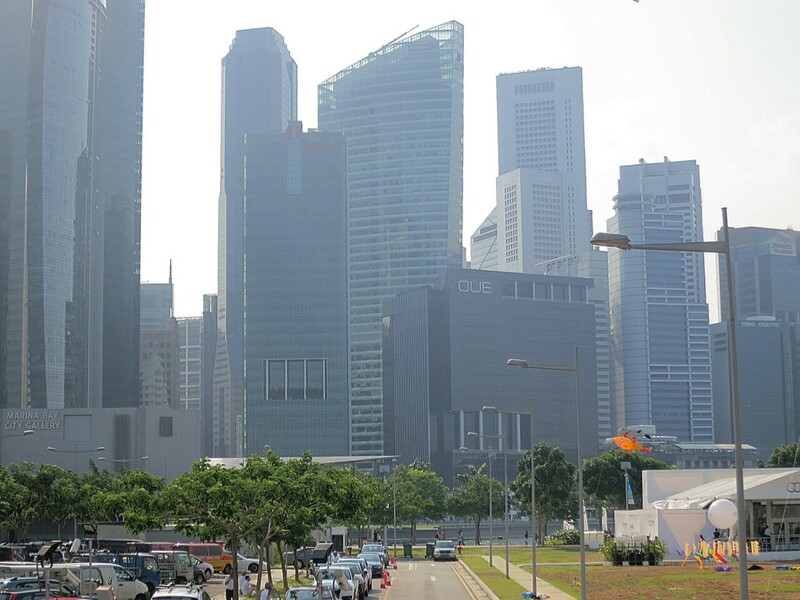 Singapore has worked to keep the city full of open spaces, manicured landscapes that include a world famous botanical garden and even a few cricket fields downtown. In fact, urban Singapore has managed to become one of the world’s biggest exporter of orchids. Who knew? And how do you get such a lovely, nice, town? By making it gut-churningly expensive. In fact, to encourage a cleaner, less congested city, there are measures in place to make it prohibitively expensive to even own a car. And Brooke and I are relatively certain that Singapore’s national pastime is going to a mall. There were lots of malls. Tons of malls. Endless malls. Many of them on the high end of the spectrum. If I had really wanted to buy Brooke an Omega watch, I had about a dozen opportunities. Cost was a factor when we skipped out on a classic visitor stop: ordering a Singapore Sling from it’s birthplace at the long bar inside the historic Raffle Hotel. At $23 a sling, that one was out of our budget. But the most amazing example of a city that works to control it’s environment through cost measures? The casinos: If you’re a resident of a Singapore and want to visit one of the stunning, new casinos in town, you are required to fork over a hundred dollars just to enter the gaming floors! I’ve never heard of such a thing – essentially an admission price to a casino that only locals have to pay. In true Kollineiser traveling style though, we’ve managed to keep our visit on the cheap. We dropped a few bucks to grab a set on an open-air double-decker tour bus. Slipped on some sunglasses, sat back and took a guided-tour for a few hours around town. These buses are becoming our preferred method of sight-seeing when we only have a short time to pack in information. The tours can be a little lacking in personality, but are certainly an easy going and quick way to get a crash course on a new town. 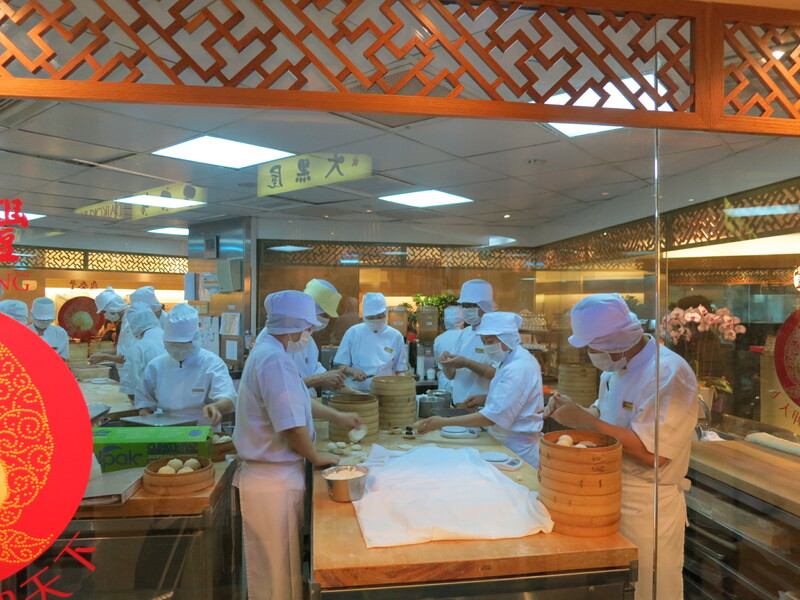 We stumbled upon Din Tai Fung – a phenomenal, busy Dim Sum restaurant where a team of cooks create dumplings and pork buns right on the spot. This might be a western city, but you can see the influence of the neighboring Asian countries all around. Particularly in the majority of dining options. Last evening, we even took some time to go see a movie. Another little international difference: upon purchasing tickets for “The Campaign” at the box office, we found that we had assigned seats in the theater! 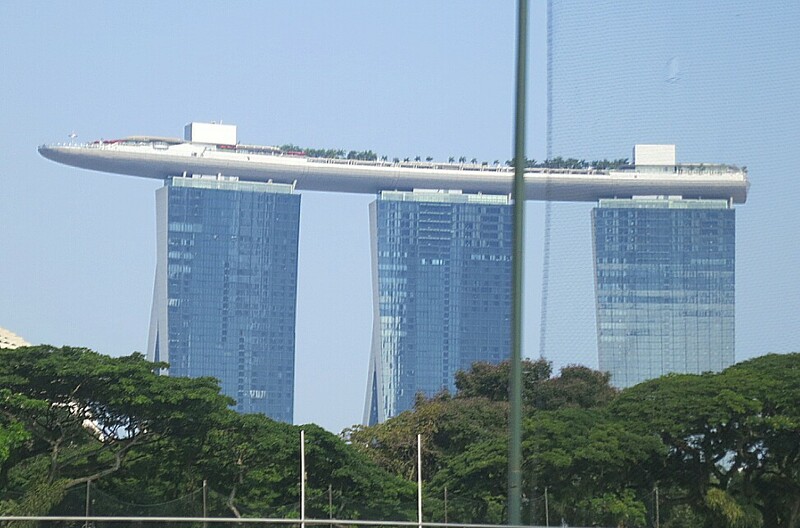 If there is one gleaming landmark worth calling out, it would be the newly built Marina Bay Sands Towers: three fifty-five story hotel buildings linked at the top by a massive cruise-ship looking Sands Sky Park. From every angle, it looks like the brainchild of a demented I.M. Pei prodigy, but it works. The city really has a sharp set of grand architecture scattered throughout. Clearly, thoughtful efforts have been made to preserve the past by repurposing beautiful old buildings and build intelligently for the future with such provisions as limiting skyscraper heights. Singapore looks at times like one giant playground. We know that’s probably not an accurate representation, but alas. The number of endless water parks that are open year round (since there is just one season around here) doesn’t exactly help that impression. And they too have a giant Ferris wheel downtown – we’re seeing them everywhere. But one of the best things that we did in Singapore was to take some time to sleep in. Our quality Air B ‘n B stay and comfortable bed allowed us to stay in bed as long as we wanted. After running at a breakneck speed through Vietnam and Hong Kong, we now feel rested and ready for Copenhagen! Overall, we enjoyed our short stint in Singapore. And since we didn’t embark on a major shopping spree or happen into some serious money to blow, two days worked out to be a good amount of time in town. Onward! One last note: we discovered a piece of boarding genius at the dazzling Singapore airport. Passengers only have to go through a security screening once they arrive at their departure gate. Each gate has its own little security. Brilliant! Are you taking notes on this, America? Also, not one other country has made us take our shoes off while going through security. Just throwing that out there. 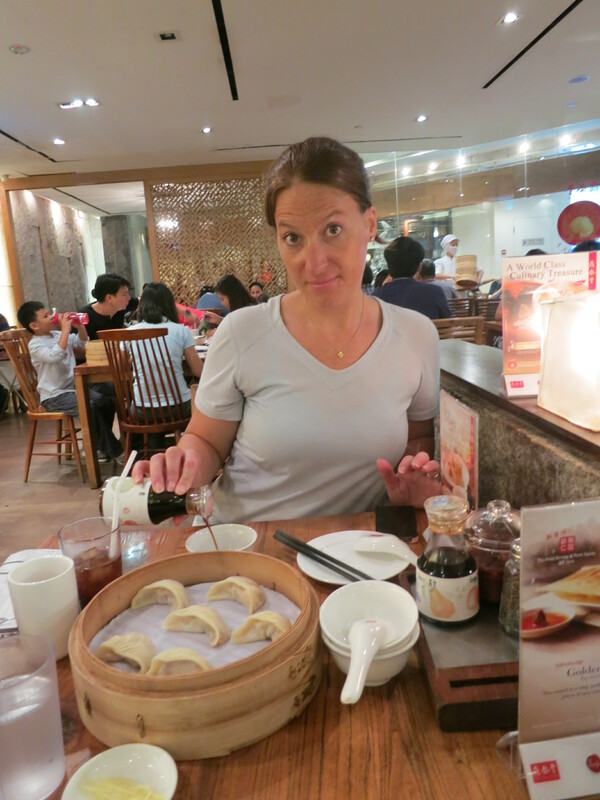 Enjoying delicious Dumplings and steamed rolls in Singapore! One last opportunity to buy high end goods in Singapore. 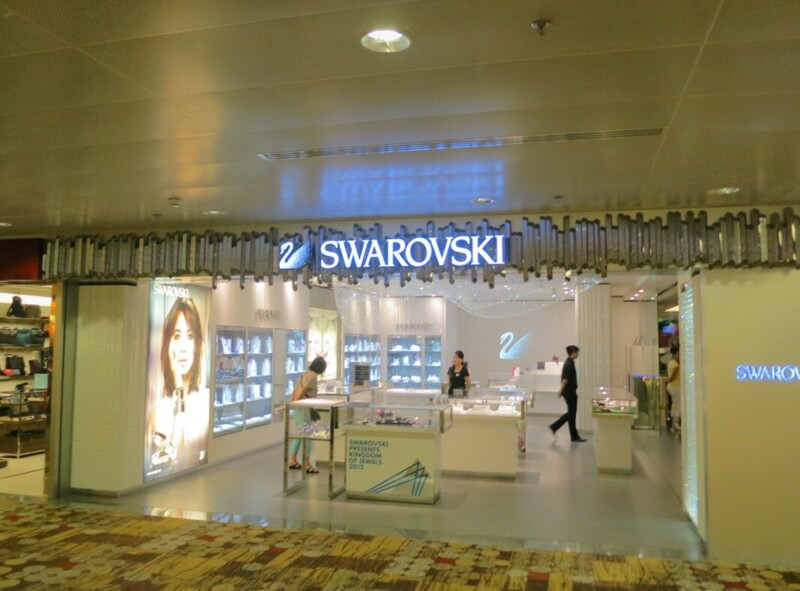 This was the hundreth Swarovski store we saw…this one at the airport. 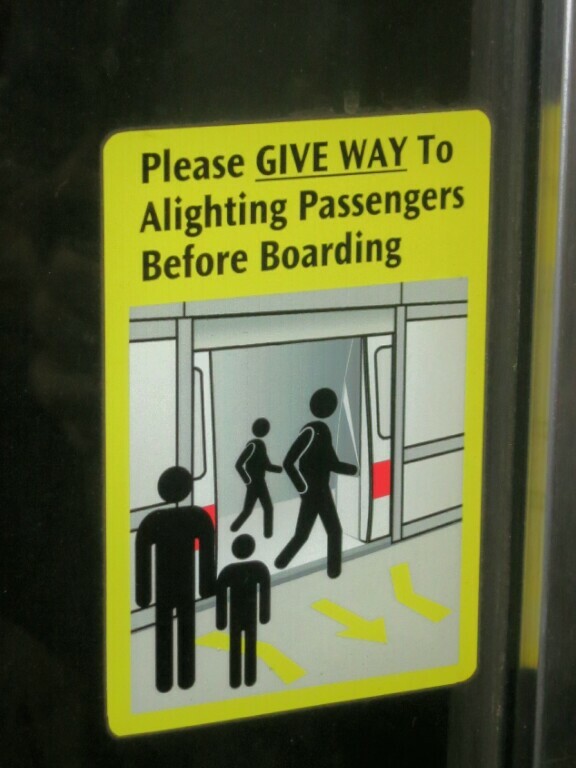 On the clean, cheap and modern MRT (subway) we kept hearing anouncements and seeing signs to Alight. I’ve never done so much alighting in my life. Those towers with the ship on top is possibly the most ridiculous structure I’ve ever seen! PS – I had to look up the word “alight”! Wishing a very Happy Birthday to Brooke on Sept. 8! Send us your email address to keep up with Luggage Tags and receive a head's up of new posts by E-mail. Follow us on our travels! Peruse the vault of all our posts from past weeks! Search through past Luggage Tags posts!